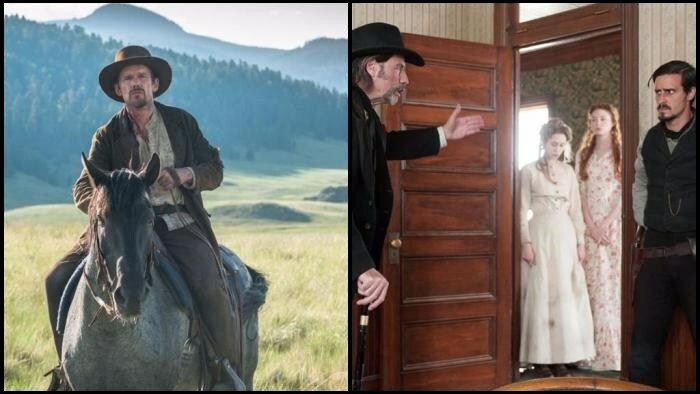 In A Valley of Violence had it's World Premiere at the 2016 SXSW Film Festival on March 12. Encore screenings will take place on March 13 and 16. Movie Critical 's guest correspondent, Anna Chu was on hand at the World Premiere of In A Valley of Violence at SXSW and we thank her for taking the time to share her review and thoughts on the film and the special Q&A with the cast and crew. Right now I feel my opinion of movies sways greatly due to just a few elements, and they're never consistent. Sometimes it's the visual effects, sometimes it's how the dialogue is captured, sometimes it's the actors. 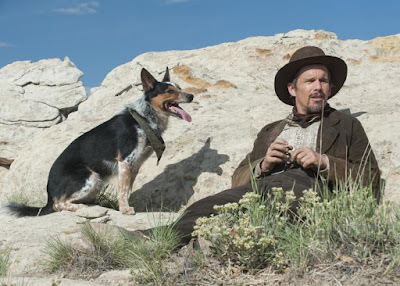 Right now what a movie needs to do to capture my attention is to kill it at the opening sequence, and with In A Valley of Violence, I was drawn in from the moment I heard the panting of a dog. The dog belongs to Paul (Ethan Hawke), a drifter travelling on horseback through the Old West. They come across a priest and his mule, the priest singing praises that his prayers were answered. He is on his way to save the town of Denton, a place full of sin. A place in much need of salvation 'especially the women. ', and it is in the town of Denton that the acceleration of violence unfolds. I have always had a fascination with ghost towns, of places left behind when people just had to up and go. Recently, my boyfriend and I went on a road trip. We were returning back to the Bay Area from Las Vegas, an 8 hour drive normally but we decided to stop 2 hours out of Vegas to Calico, an old mining town with a current population of 9. Today it's a tourist attraction, with a general store, a local saloon, remnants of a bathhouse and a small school hall perched on the edge of town. It used to be an old silver mining town and at the height of its silver production during 1883 and 1885, Calico had over 500 mines and a population of 1,200 people. When Paul finds himself passing through Denton on the way to Mexico, it is a town on its way to becoming tomorrow's Calico, the dust blowing through the streets and taking up most of the space of the local stores and homes. Of the few people who are left in the town, there is a whole lot of fear and not much else. 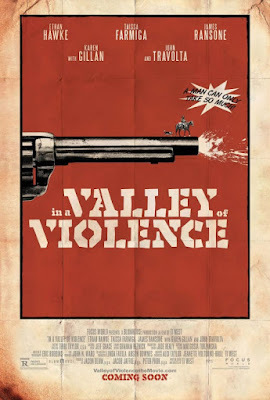 The Marshal (John Travolta) and his son Gilly (James Ransone) have a controlling grip on this town, and not much is revealed as to why or how this came to be, but the town's reputation of being the 'Valley of Violence' hints at the cause. Many elements of the film are extremely bloody and with director Ti West's horror film pedigree it doesn't come as much of a surprise. It doesn't overtake the film but adds to the realistic aesthetic. When Paul enters the town for the first time, it looks exactly like an abandoned outpost in the middle of nowhere. The murders, shootouts and barroom brawls you read about were all too real and regular in occurrence. What I appreciated were some of the nods to the horror film genre in this movie, such as the one-by-one knocking off of characters and not knowing when or how the next person would be killed. Also the use of 'scary sounds' as one of the producers described during the start of ambush scene. I felt that Ti's horror resume added a different dynamic to this film that got me jumping out of my seat and my hand over my mouth in big moments of the film that I wasn't expecting. One of the biggest strengths of the movie are the actors and their well-written characters. If we had McConnaissance, we may just have a resurgence of Travolta and Hawke. Both actors were cast so well, and I'm shocked that we haven't seen Hawke play a cowboy-type character before (if we have, pardon my ignorance). Travolta brings the comedic elements to the film as the reluctant antagonist to Paul. James Ransone's Gilly is the one we love to hate, his bravado verging onto masochism as he gets beaten up every time. He is scariest at the end when he starts to forget about his pride and his pain and focuses more on vengeance. And the women! Oh do I love the bickering between Mary Anne (Taissa Farmiga) and Ellen (Karen Gillan). It's so shrill that my ears were about to ring, but they were so strong I only wished they had more screen time. However, the one actor we can't forget is the dog in the film. At the Q&A, Hawke joked that he must have appreciated his work in White Fang,but gave full credit to the trainer who happened to be trainer for the dog in The Artist. Hawke commented that the best experience a young actor can get is to work with animal actors because you can't pretend - the dog will think you're acting weird if you're not yourself. Whatever it was, the dynamic between Paul and his dog could not have been better. So what do you get when you combine a priest, a drifter, his dog, the town marshall, his son who's also his deputy, his cronies, the deputy's fiancé and her sister? A bloody and smart homage to westerns from the red and white on black opening credits right the way down to the surveying of the damage at the end. They were so accommodating and I was truly impressed. It is such a comfortable environment. For a buffet, it was delicious food at the party venues. Alcoholic beverages were also great. Overall, this place is great, and my favorite venue in the city. Really a nice stuff,the images shown are rare one and not found in other webpages. keep sharing such a relevant content. Greatful to find useful content like 18trend.